It was a little over four years ago that a good friend and I sat down and brainstormed about starting an environmental company that would focus on quality client service and volunteer work in the area of environmental consulting while attempting to incorporate a balanced (eco-hydrological) approach to projects. We envisioned a simple environmental (Eco) office near the ocean (Kai) - a few days later EcoKai was born from a small location in downtown Manhattan Beach – my house! Saturday June 8th, is the fourth anniversary of the incorporation of EcoKai Environmental, Inc. whose formation also coincides (ok… by chance) with the first international World Oceans Day in 2009 – recognized each year on June 8th. Join with us today in celebrating the fourth anniversary of both the United Nations’ International World Oceans Day and EcoKai’s four year anniversary! During the last four years EcoKai’s partnership with organizations like 1% for the Planet, Friends of Ballona Wetlands, California Envirothon, Natures Bridge, and Cal State Los Angeles have provided tremendous educational opportunities and heightened awareness of environmental issues throughout the region. 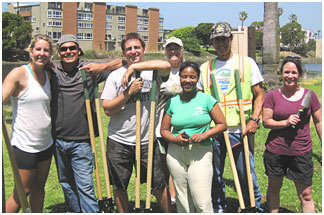 I am honored that last year EcoKai staff members donated over 300 hours of volunteer time on the communities behalf. EcoKai continues to find success in the consulting industry with recent project awards in the City of Del Rio TX, Kinney County TX, Eastern Sierra, Southern California Edison, state and federal regulatory permitting, and continued support to E. Read and Associates and also to HELIX Environmental Planning and the Metropolitan Water District. Someone once said - “People are your most important resource”, this is especially true with EcoKai! OUR company is literally fit and held together by that which each team member brings to the table. I appreciate the progress we have made and your continued support and trust in our team. Together, let’s make a difference.